This Easy Vegetable Lasagna Recipe is a lightened up take on a comforting classic that still tasted decadent. 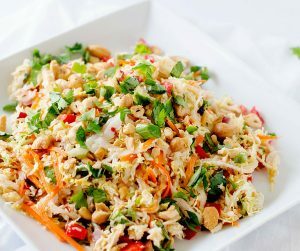 It is the perfect way to incorporate fresh produce into a one-dish meal that your family is going to love. I’ve used gluten-free noodles, but whole grain or conventional pasta will work perfectly if your family doesn’t avoid gluten. This easy and delicious dinner is one you will make time and again. 4.1 What Vegetables Are Good In Lasagna? 4.2 Do I Have to Cook Spinach Before Putting it in Lasagna? There is a lot to love about this time of year in Florida! One of my favorite things is hitting the farmer’s markets. It is finally cool enough to enjoy it, and there is still a lot of produce available in the winter. Maybe it is because they know that I get excited when my refrigerator is packed with freshness in the same way some girls get excited by new clothes. To me, there is nothing better than creating a delicious family meal with fresh veggies. The perfect example is this Easy Vegetable Lasagna Recipe. I started sneaking vegetables into lasagna when the boys were little. At first, they resisted the “green stuff”, but over time that just accepted it. It was my secret weapon for getting them to at least get SOME vegetables into their diet. Now, it is just the way I make lasagna! While lasagna can sound like a meal that would take a lot of time, this dish came together in a flash. I used Slow Cooker Marinara that I had in the fridge, but you could use jarred pasta sauce just as easily! This is the kind of recipe I love to get the kids involved in preparing! 2. Combine ricotta, Parmesan, egg, garlic, basil, parsley, crushed red pepper and cooked spinach. 3. Spray a casserole dish and spread 1/2 cup marinara on the bottom. 4. Top with a layer of noodles, a layer of zucchini,1/2 of the ricotta mixture and mozzarella. 6. End with a layer of noodles, marinara, and remaining mozzarella. 8. Allow to cool for 15 minutes prior to serving. Use Eggplant or Summer Squash in place of the zucchini. Use a Creamy Tomato Sauce in place of traditional pasta sauce. Omit the noodles all together and make Zucchini Lasagna. What is your favorite way to incorporate farm fresh ingredients into your meals? There are so many vegetables that work in lasagna. You can saute red pepper, onions and mushrooms and add any of them to your lasagna. Zucchini, spinach, squash and eggplant are other great options. 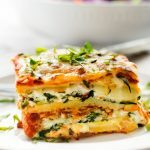 Do I Have to Cook Spinach Before Putting it in Lasagna? Yes, you need to cook spinach before you put it in your lasagna. 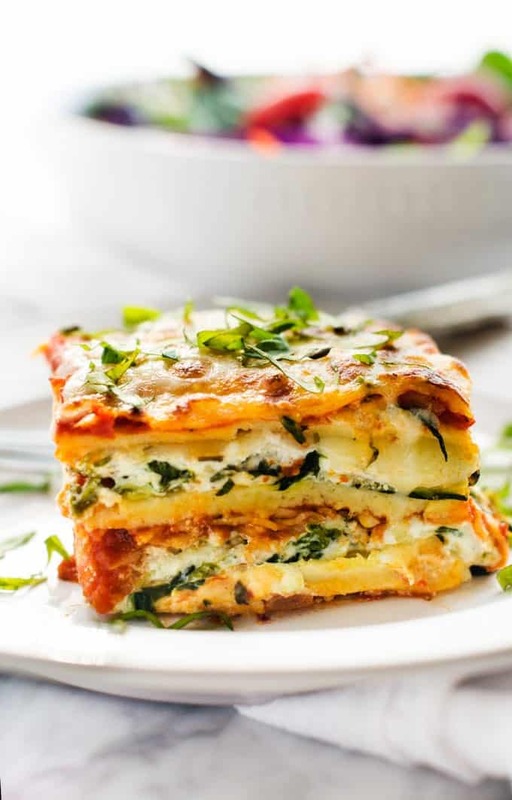 The reason is that spinach gives off a lot of liquid when it is cooked and if you do not pre-cook it before putting it into your lasagna it will be very watery. If you make this easy vegetarian lasagna recipe let me know how it goes! 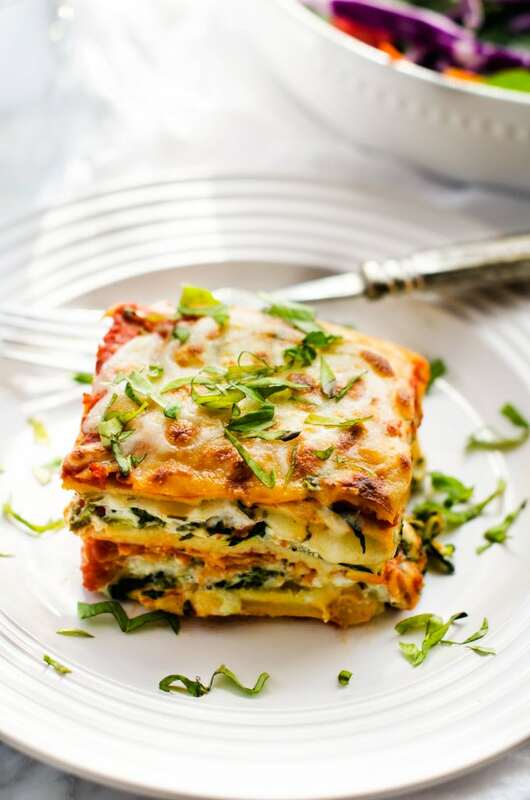 If you’ve tried Easy Vegetable Lasagna or any other recipe on the blog then don’t forget to rate the recipe and let me know how it went in the below comments, I love hearing from you! You can also FOLLOW ME on FACEBOOK, TWITTER, INSTAGRAM, and PINTEREST to see all my delicious recipes. You won't believe how quickly this Easy Vegetable Lasagna Recipe comes together! 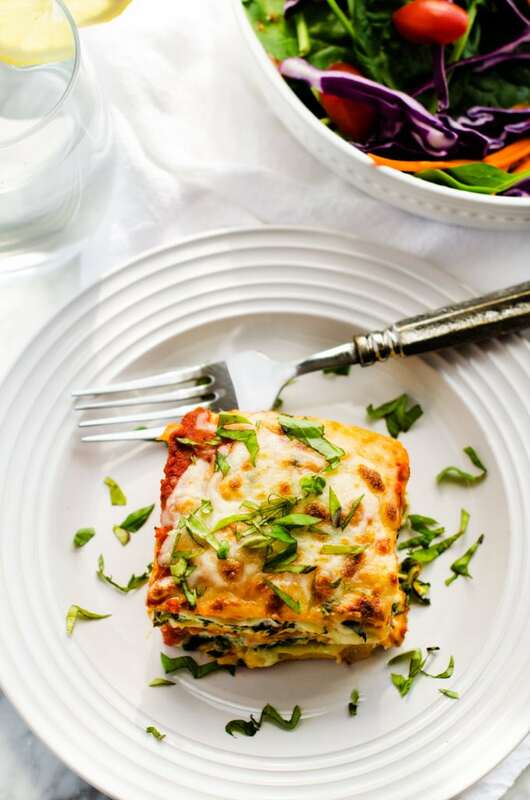 Packed with veggies, this easy vegetarian lasagna recipe is a staple recipe your family will beg you to make time and again! Gluten Free. Heat a skillet to medium heat and spray with oil. Season zucchini strips with salt and pepper. Cook for 8 to 10 minutes. (The cooking time will vary according to how thinly you slice your zucchini.) Remove from heat and set aside. Coat a 13 x 9 casserole dish with cooking spray and spread 1/2 cup of the Marinara on the bottom. Top with a layer of noodles, a layer of zucchini, 1/2 of the ricotta mixture and mozzarella. Spread 1/3 of the remaining marinara and repeat the layers. End with a layer of noodles, marinara and remaining mozzarella cheese. Bake for 30 minutes. Allow to cool for 15 minutes prior to serving. Use vegan ricotta, Parmesan, and mozzarella. Most pasta is vegan but double check! This looks SO delicious! I have zucchini and a slicer, what am I waiting for! I need to try this! Prego® Farmers’ Market Classic Marinara looks heavenly! Oh my how wonderful thsi is. I am always looking fro ways to have filling meals without the meat. this one is definitly going to be eaten. I love a good veggie lasagna! This one looks amazing- can’t wait to try! Thanks for sharing! I didn’t think I would like this, but whoa, your photos are seriously making me hungry right now! 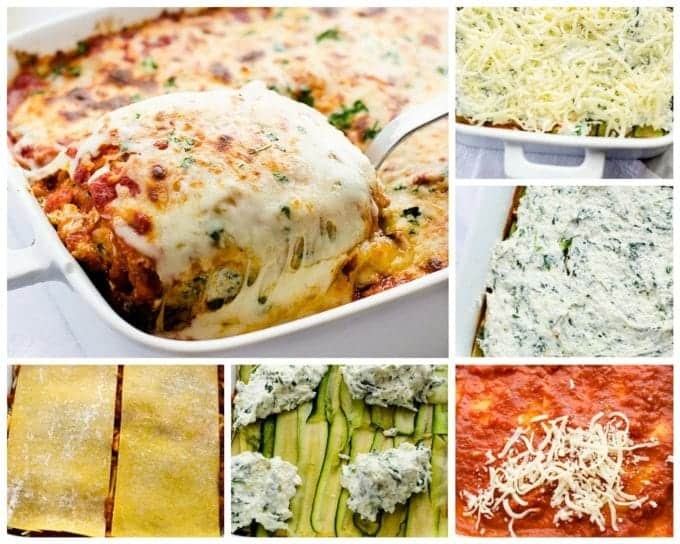 I LOVE the idea of zucchini is lasagna! Sneaking in extra veggies is always on my to-do list! This sounds absolutely amazing! I love veggie lasagna! I am going to try this out next weekend! This looks amazing!! My kids love Lasagna this would be a great way to get them to eat some more veggies as well! 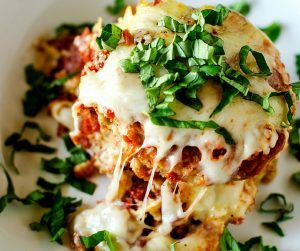 I’ve never heard of Prego Farmer’s Market sauce, but now I’m going to have to try it and this delicious lasagna recipe. I’m a total Prego girl, but I have not seen these Farmer’s Market sauces in my grocery yet. I’m so on the hunt for them this weekend. This veggie lasagna is beautiful. I love love veggie lasagna! I think I even have gluten free lasagna noodles in the pantry so I can make it this weekend. I love veggie lasagna! I really have to give it a try and turn that AC way up! I love a good veggie lasgna and the presentation of yours is breathtaking. I love the idea of adding squash. I will have to look into that sauce at Walmart. I am a Ragu type of person but love trying different types. My husband is a vegetarian so I love making veggie lasagna. Can this be made the day before and then baked? Not sure how the zucchini would hold up. Yes, it can! The photo was actually done that way. Can i make this and refrigerate a day in advance of baking it?